The following students have been recognized as the 6th Grade Students of the Month at Adair County Middle School. Hallie Burton-Math, Kylie Cowan-Science, Matt McGuffin-Math, Natalie Stearns-Reading, Lakota Lemmon-Social Studies, Briana Caldwell-Reading, Brenton Billingsley-Social Studies, Tristen Keith-Science, and Amber Moore. Congratulations to these deserving students! “Amber Moore is an 8th grader at ACMS. 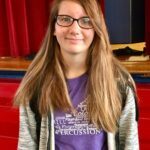 She has been a member of the award winning ACHS Marching Band for two years, takes classes at ACHS as an 8th grader and is a terrific all around good student.”-Mrs. Alma Rich.